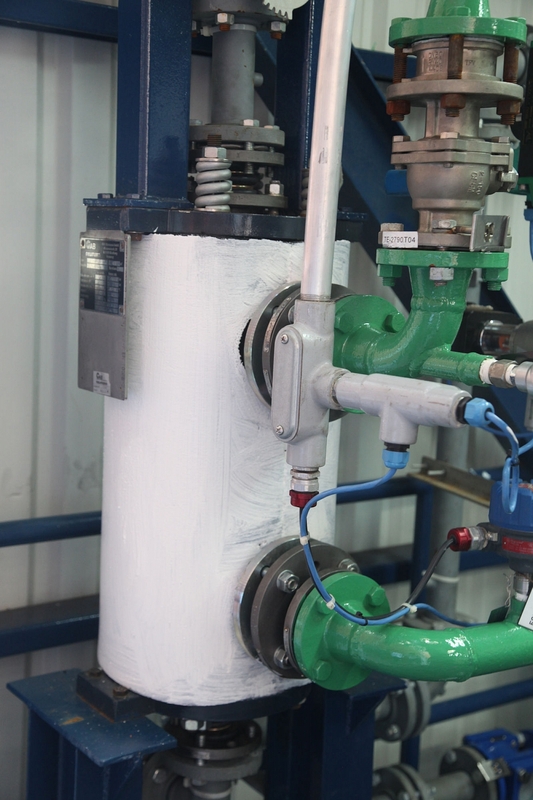 GAB Neumann offers a complete range of processes in the field of hydrogen chloride (gaseous HCl) and hydrochloric acid (liquid HCl) treatment. It includes the absorption, cleaning, desorption, rectification, re-concentration (above the azeotropic point) and scrubbing of hydrochloric acid. GAB Neumann offers the complete range of associated services including basic engineering, detail engineering, procurement, construction, project management, and start-up of these units. 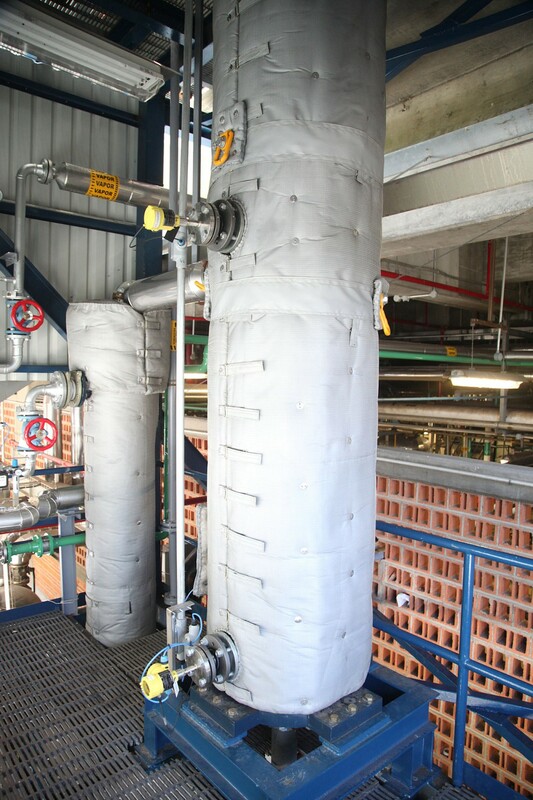 Bottom section of the HCl azeotrope reboiler (left) and the HCl azeotrope cooler (right) in an anhydreous HCl generation plant. 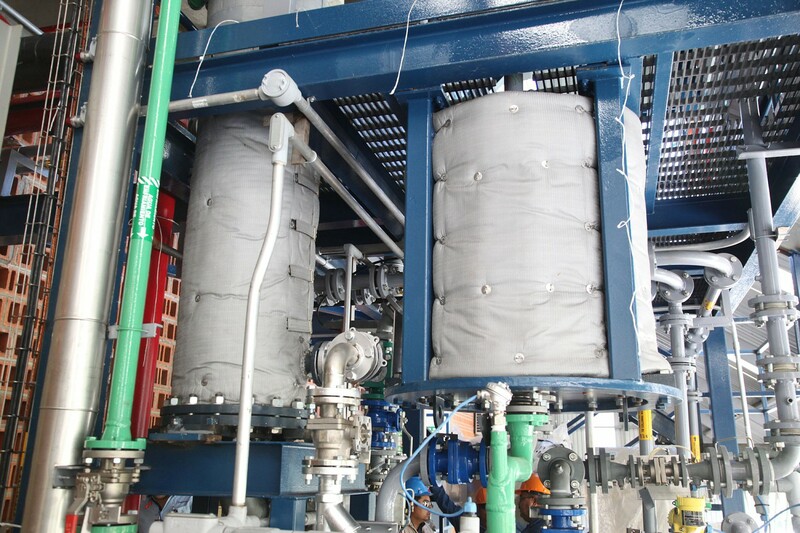 Upper section of the hydrochloric acid (HCl) azeotrope graphite reboiler (left) and lower section of the HCl rectification graphite column (right) in an anhydreous HCl generation plant. Upper section of the HCl distillation graphite column in an anhydrous HCl generation plant. 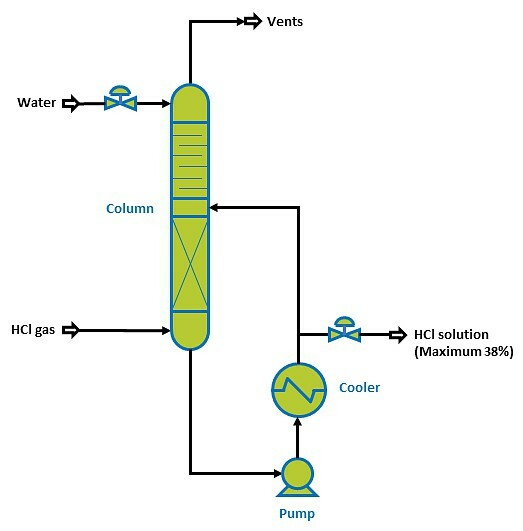 Primary condenser in an anhydrous HCl generation plant. It is cooled with cooling water. 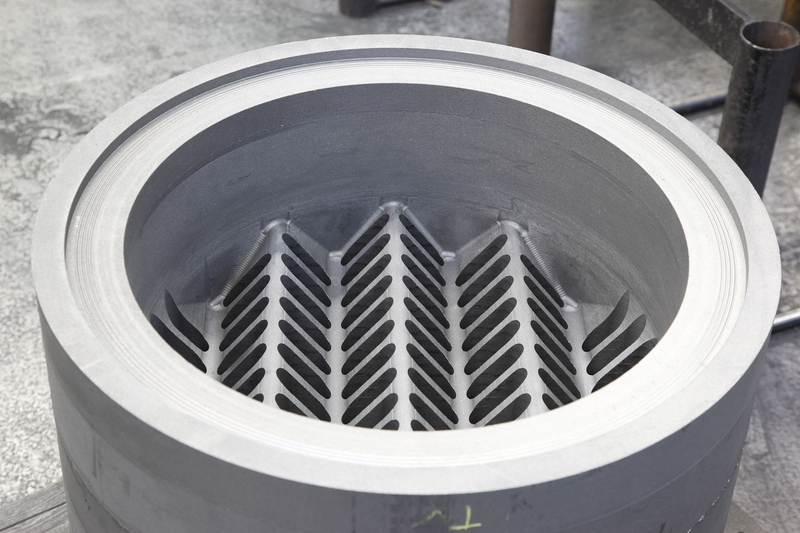 Knock-out drum in graphite in an anhydrous HCl generation plant. This device prevents the entrainment of droplets with gaseous hydrochloric acid. Support grid located right below a carbon Raschig rings section inside a graphite column. 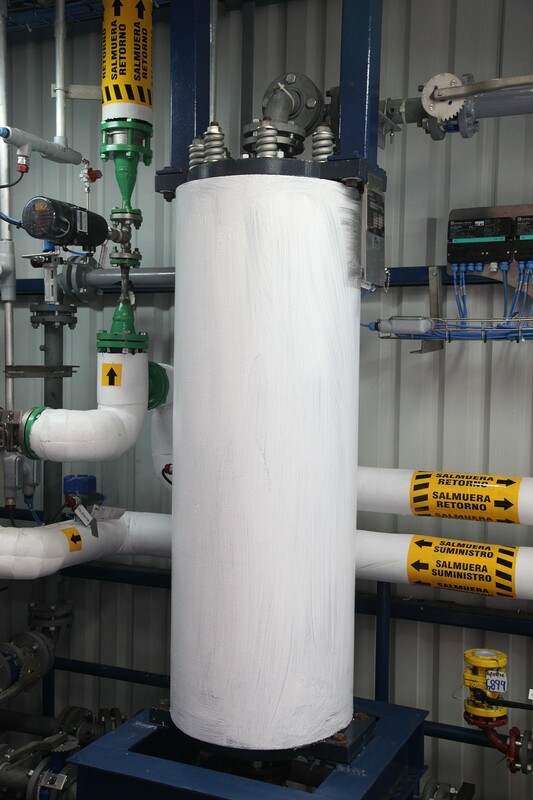 This column is part of an anhydrous HCl generation plant. 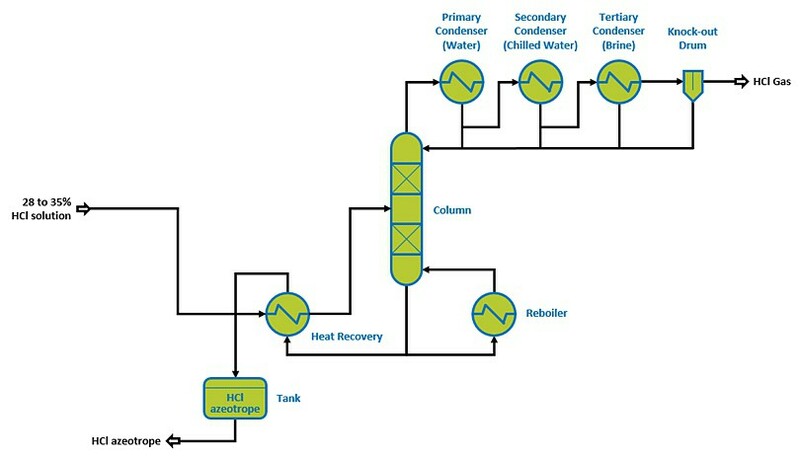 Modular design: the different pieces of equipment (absorber, columns, reboiler, primary, secondary and tertiary condensers) of the system can be adapted (height, diameter, heat transfer surfaces, columns internals) to the process requirements. 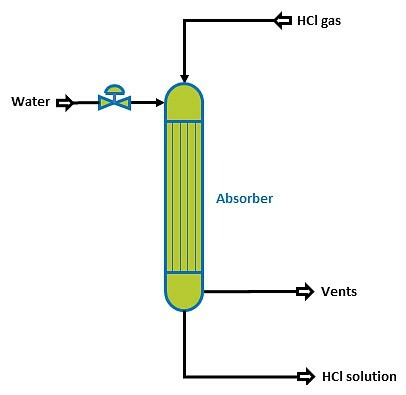 Adiabatic absorption of hydrogen chloride can be easily achieved in a packed column. 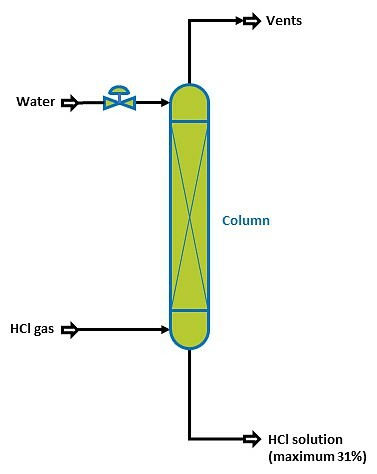 Gaseous hydrogen chloride enters at the bottom of the column while fresh water enters at the top and is distributed over the whole packing cross-section. The absorption process is exothermic (approximately 2100 kJ/kg of absorbed HCl) therefore the hydrochloric acid solution gets easily warm thus limiting the maximum concentration of the acid to approximately 31%. The isothermal absorption of hydrogen chloride can be achieved in a packed column with an external recirculation and a cooler. 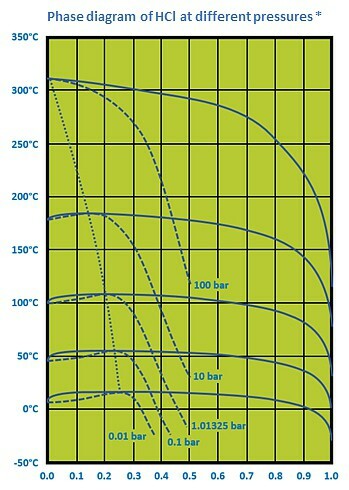 The enthalpy of absorption is removed by the cooling water. A maximum concentration of 38% can be achieved this way. 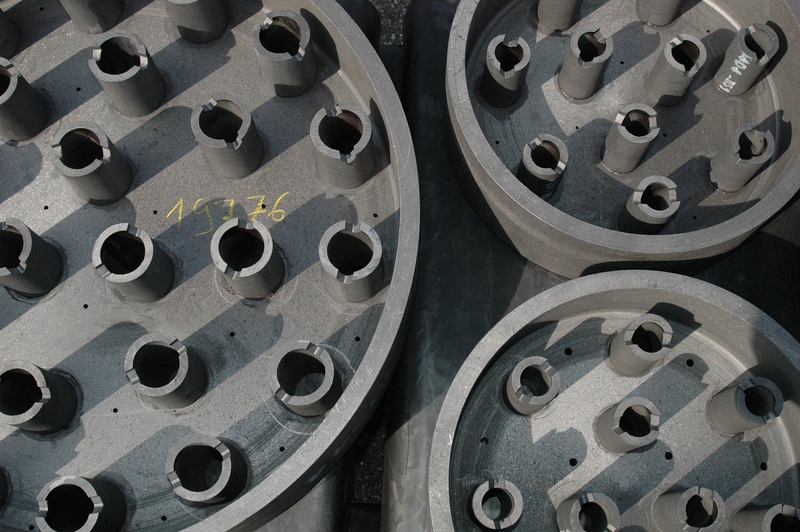 The very same operation can be also achieved in a falling film absorber. 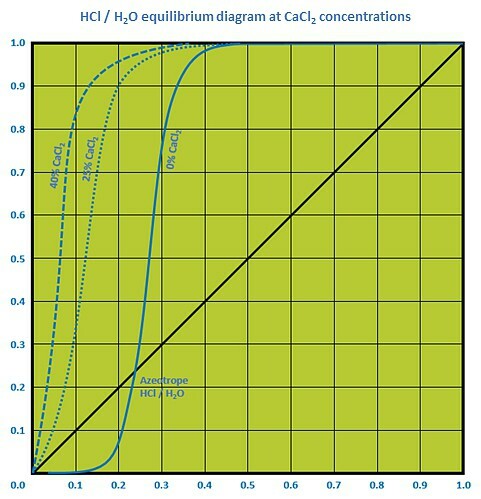 HCl solutions can be rectified both below and above the azeotropic point. Successive rectifications over different temperature ranges allow the separation of contaminants / pollutants such as fluorides, chlorides, bromides, iodides, organic compounds (volatile on non-volatile), salts, or solvents among others. Highly concentrated hydrogen chloride can be produced from 28 to 37% hydrochloric acid. Gaseous hydrogen chloride at more than 99% can be easily produced at the top of a rectification column. The HCl-rich vapors are then successively condensed in a series of condensers operating at colder and colder temperatures. The first condenser is cooled with cooling water. The second condenser is cooled with chilled water. Finally, the third condenser is cooled with brine or ethylene glycol. Finally, a knock-out drum prevents the entrainment of droplets. With this method, it is possible to produce hydrogen chloride with less than 50 ppm of moisture. 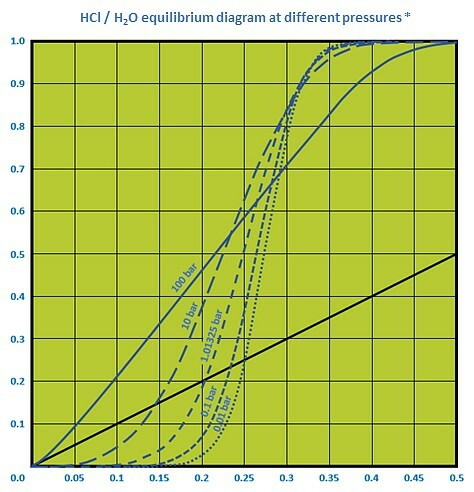 The HCl / H2O mixture presents an azeotrope at a concentration of 20.3% (calculated using the Mixed Solvent Electrolyte model of OLI Systems, Incorporated) in weight at atmospheric pressure. The concentration processes consist of going around or displacing the azeotropic point. The concentration of the HCl / H2O azeotrope varies with the pressure. 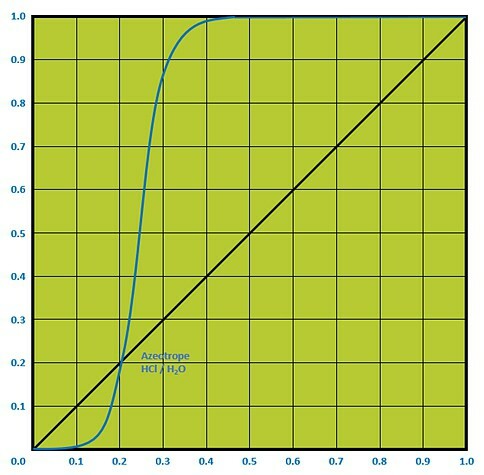 The HCl / H2O azeotrope is slightly less concentrated at high pressure than at low pressure. It is therefore possible to overcome the azeotropic barrier by transferring HCl / H2O azeotropes at two different concentrations between two columns at different pressures. 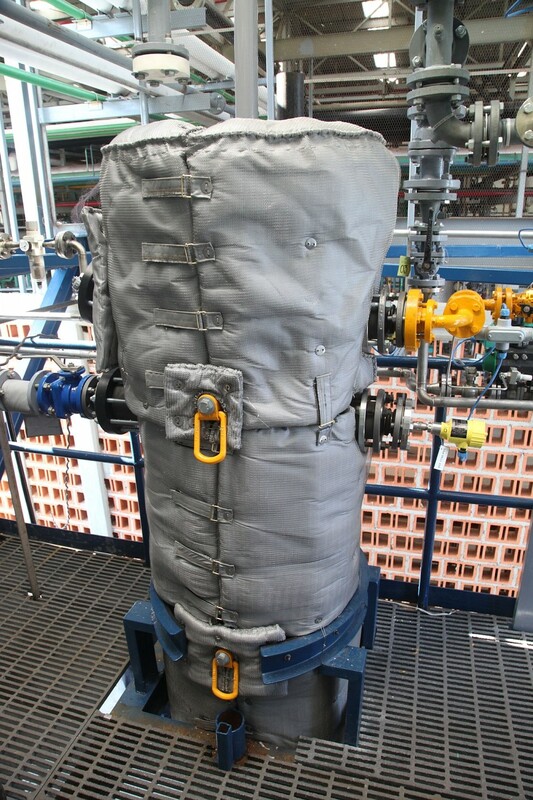 The first rectification column operates under vacuum. 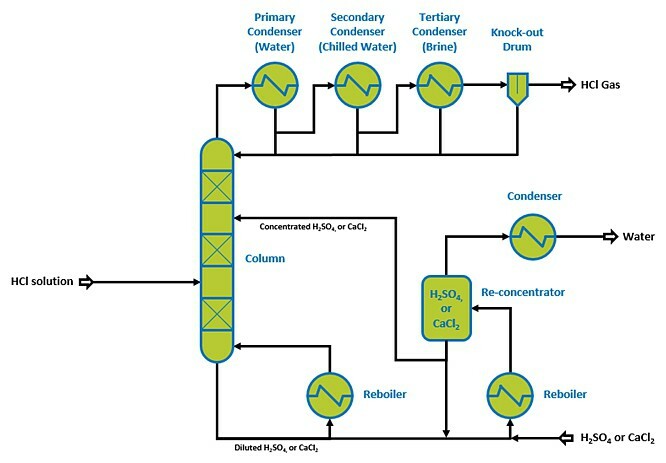 Water is extracted at the top while the HCl / H2O azeotrope comes out at the bottom and is fed into the second column that operates above atmospheric pressure. 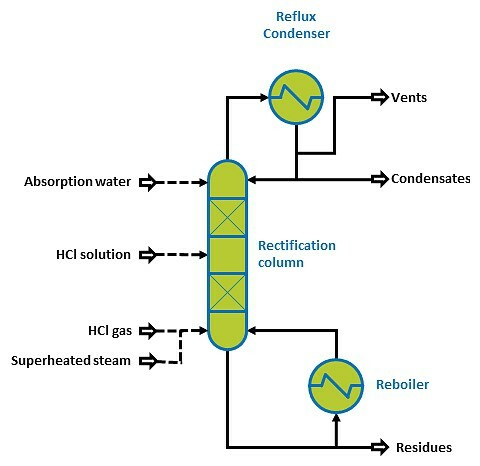 In the second rectification column concentrated HCl is produced at the top while the HCl / H2O azeotrope comes out at the bottom and returns to the first column. 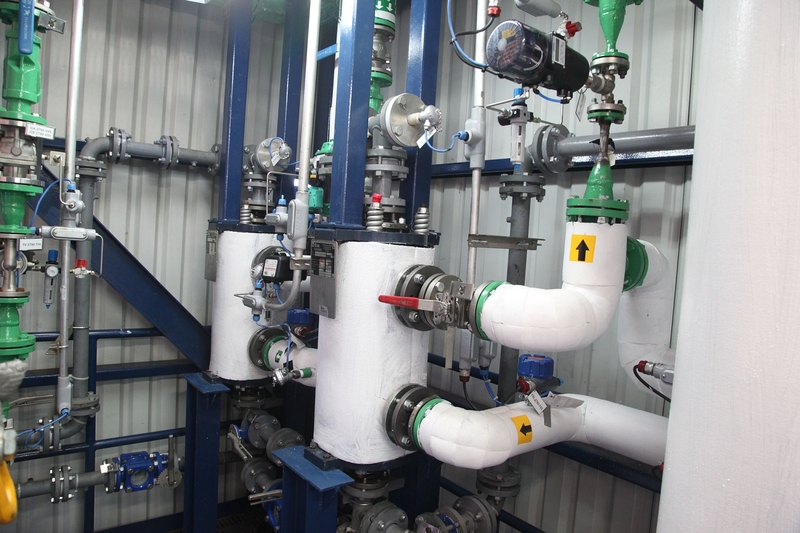 Thanks to the lower operating pressure the azeotrope coming out at the bottom of the first rectification column has a "slightly" higher concentration (above 22%) than the azeotrope coming out at the bottom of the second rectification column (below 17%). Due to the necessity to go around the azeotrope, the whole rectification process is rather capital intensive and energy consuming. The relative volatility of the HCl can be changed by adding an extractive agent to the mixture. The change in volatility moves or even eliminates the azeotrope. 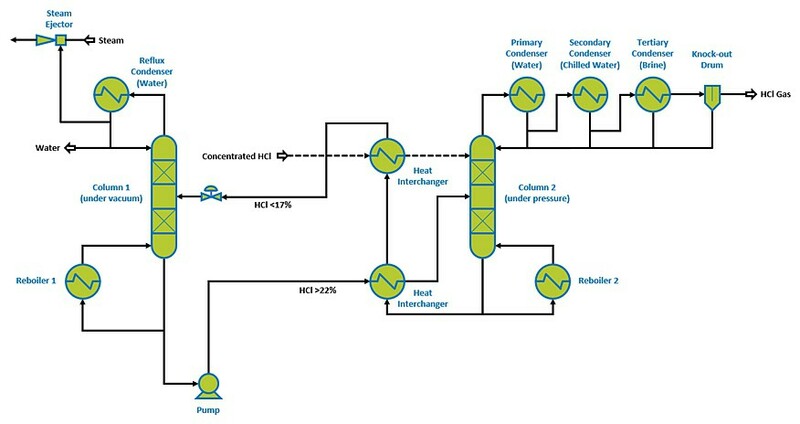 The extractive distillation process involves the addition of an extractive agent with hygroscopic properties to shift or remove the azeotropic point and increase the volatility of HCl. Sulfuric acid (H2SO4) and calcium chloride (CaCl2) are the most commonly used extractive agents. The concentrated extractive agent enters an extractive / rectification column in graphite where it traps water. The diluted extractive agent leaves the column at the bottom before being re-concentrated. Highly concentrated HCl gas leaves the column at the top. 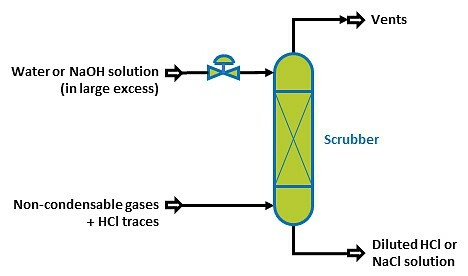 Scrubbers are commonly used to remove traces of HCl and / or halogens (e.g. Cl2) in vents. They operate with an excess of absorption water therefore external cooling is not necessary. To neutralize the HCl, it is very common to use an aqueous sodium hydroxide (NaOH) solution as the scrubbing fluid.